Cradle cap is probably caused by hormones from the mother. These hormones cross the placenta before birth. The hormones cause the oil glands in the skin to become overactive. They then release more oil than normal. Dead skin cells normally fall off. The extra oil causes these cells to "stick" to the skin. These cells form yellow crusts and scales on the scalp. 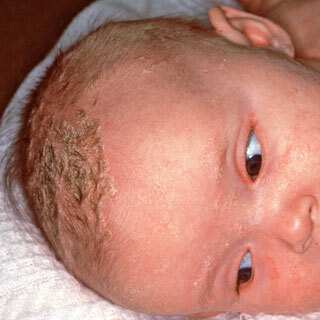 Cradle cap is a common skin condition of newborns. It's caused by overactive oil glands in the scalp. It's harmless and will go away on its own. But it takes time. Wash the hair with an anti-dandruff shampoo (such as Head and Shoulders). Do this twice a week. No prescription is needed. Note: The daily use of anti-dandruff shampoo isn't approved until after 2 years old. But, using it twice a week is fine. On the other days, wash the hair with baby shampoo. While the hair is lathered, massage the scalp with a soft brush. You can also use a rough washcloth or your fingers for 5 minutes. Don't worry about hurting the soft spot. If the scalp has thick crusts (scales), put some baby oil on the scalp. Do this for 15 minutes before shampooing to soften the crusts. Cradle cap lotions for loosening up the scales are also available without a prescription. Apply the lotion 15 minutes before shampooing. If the rash on the scalp is red and irritated, use 1% hydrocortisone cream. An example is Cortaid. No prescription is needed. Put this on once a day. After 1 hour, wash it off with soap and water. Do this for 7 days or less. Cradle cap will eventually go away on its own between 6 and 12 months of age. Usually, it doesn't cause any symptoms (such as pain or itching). Therefore, treatment is optional. It is mainly done for cosmetic reasons. Shampoos, lotions and brushing will reduce the thickness of the scales. They will usually make them go away sooner. Cradle cap cannot be spread to others. Your child does not need to miss any child care. This shows a baby with cradle cap on the eyebrows and eyelids. Cradle cap looks oily, yellow, scaly and crusty.